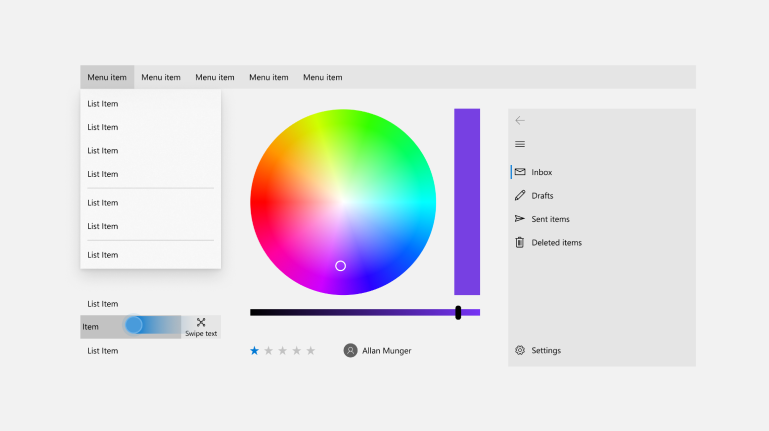 The Windows UI Library provides official native Windows UI controls and other user interface elements for UWP apps. It maintains down-level compatibility with earlier versions of Windows 10, so your app works even if users don't have the latest OS. New controls: The Windows UI Library contains new controls that aren't shipped as part of the default Windows platform. Updated versions of existing controls: The library also contains updated versions of existing Windows platform controls that you can use with earlier versions of Windows 10. Support for earlier versions of Windows 10: Windows UI Library APIs work on earlier versions of Windows 10, so you don't have to include version checks or conditional XAML to support users who might not be running the very latest OS. Support for XamlDirect: The Xaml Direct APIs, designed for middleware developers, gives you access to a lower-level Xaml features which provide better CPU and working set performance. XamlDirect enables you to use XamlDirect APIs on earlier versions of Windows 10 without needing to write special code to handle multiple target Windows 10 versions. The Xaml Controls Gallery sample app includes interactive demos and sample code for using WinUI controls. How-to articles for Windows UI Library controls are located with the rest of our UWP controls documentation. API reference docs are located here: Windows UI Library APIs. For instructions, see Getting started with the Windows UI Library. The Windows UI Library contains multiple NuGet packages: Windows UI Library NuGet package list.